The new game is a much-needed shot in the arm. Like any long-running series, Resident Evil has had impressive highs and a few embarrassing lows. Every game has its defenders—except maybe Operation Raccoon City—but I think most people will agree that, recently, there have been more lows than highs. I mostly enjoyed Resident Evil 5, but it was obvious that it paled in comparison to 4. And this slow decline in quality led, inevitably, to the indulgent mess that was 6. Years of bewilderingly complex mythology and an increased focus on action over survival horror left the series bloated and confused, and a new approach was desperately needed. 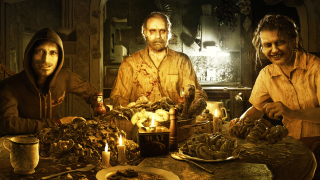 And salvation arrived in the form of Resident Evil 7: Biohazard, the best game since Shinji Mikami and his team boldly reinvented the series in 2005 with Resident Evil 4. I went into it blind, having religiously avoided previews and trailers, and emerged from the darkness delighted that Resident Evil was good again. Before I played it, the switch to a first-person perspective led me to believe it would be a total reinvention of the series, mimicking fashionable modern horror games like Amnesia and Outlast. And while there are traces of that in there, it really has more in common with the early Resident Evil games: from the arcane puzzles that steadily unlock more of the house, to the soothing music that plays in the safety of a save room. For me, the mythology has always been the least interesting thing about Resident Evil. I was invested in it once, long ago, but over the years it became so swollen and complex that I tuned out. Which is something Resident Evil 7 swiftly corrects by making it simple again. You aren’t a super-agent trying to save the world from the threat of bio-terrorism: you’re a man looking for his wife in a swamp. It gets more complicated later, but having that simple, human motivation at its core makes for a more focused, engaging, and emotional story. And as an added bonus, playing as a normal person makes it scarier too. You feel more vulnerable as Ethan than you ever did as the cocky, capable Leon Kennedy or the ludicrously muscled Chris Redfield. It’s the puzzle-solving, atmospheric exploration, item management, and occasional burst of action that I love about Resident Evil—and those are all things the new game does incredibly well. The pace is almost always slow and steady, with plenty of quiet, tense exploration between enemy encounters. Spacing out the action like this not only heightens the tension, but gives you time to familiarise yourself with the environment too. Of course, it also uses this familiarity to play tricks on you, like enemies suddenly appearing in a hallway you’ve passed through safely a dozen times before. Resident Evil 7 isn’t constantly bombarding you with enemies, set-pieces, and cut-scenes. The developers know when to just shut up and let your imagination do the work for them. Nervously wondering what lies around the next corner, and imagining what it could be, is more powerful than throwing an enemy at you. A trick borrowed from Silent Hill, which uses the fear of the unknown to quietly whittle away at your nerves. It doesn’t maintain this for the whole game—I sprinted through the last third, calmly shooting any enemies that got in my way—but this is by design. A cathartic reward for eight hours of patience and item economy. The game expertly balances power and powerlessness, lulling you into a false sense of security then brutally punishing you. My heart still belongs to the pre-rendered backgrounds and fixed cameras of the early Resident Evil games, but the shift to first-person in 7 works a lot better than I thought it would. Ethan’s intentionally slow movement means you can’t strafe around like you’re in Quake, and there’s a satisfying weight and creepy intimacy to the combat. Resident Evil 4 remains the highlight of the series in terms of combat, enemy design, and pure style, but I’m surprised by how Resi-like the combat in 7 feels despite the change of perspective. My only criticism is the lack of enemy variety. I would have liked a few more interesting things to shoot at, not just variously shaped blobs of evil black jam. I did enjoy some of the cheesy melodrama and over-the-top action in the last few games. But when your atmospheric survival horror series reaches the point where the hero is fighting a monster in a volcano, maybe it’s time to dial it down a bit. And that’s exactly what 7 does. But, crucially, it still feels like Resident Evil. The spirit of the series is still intact, even after the developers have aggressively trimmed a lot of the fat that was weighing it down. And you’re left with not only a fantastic, lean, well-designed horror game, but arguably the best numbered sequel since 2005. I can’t wait to see where they take the series next, but hopefully they’ve learned some lessons from past mistakes. I don’t want to see a muscular Ethan punching a rock a few games down the line.